As a child I was an enthusiastic fan of model trains. With my children and with their interests and pleasure for trains, my former enthusiasm for real and small trains returned and that was why we decided to build a new model railroad layout. It goes without saying that the new layout and technique should be on the newest available standard and very close to the real world of the Swiss Railway Company. For months I studied the new possibilities and products now available in the market and the newest development of the Swiss Railway Company. The layout is made with three independent lanes. Two of them are divided into three separate blocks, each of them controlled with a signal. The inner circle is equipped with a fully automated pendulum system. This allows the train to enter into the station and to leave the station after a pre defined moment in the opposite direction. The station has 4 rail tracks and functions similar to the S-train station of the Zurich main station. 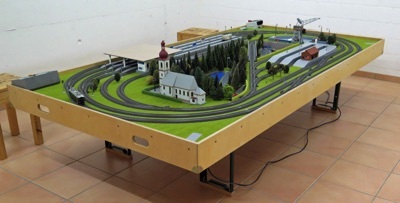 The model railroad can be operated automatically or manually. 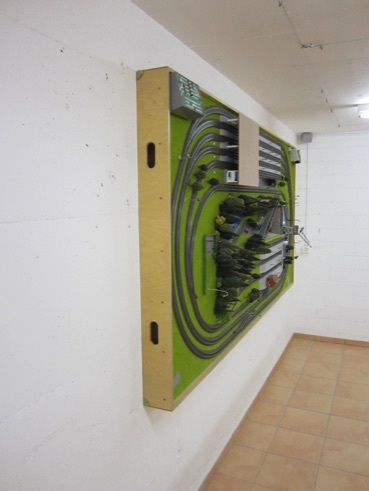 The automatic modus allows the system to run up to five short trains simultaneously and without the risk to crash the trains. The model railroad layout was built in such a way, that the entire construction remains mobile and transportable. When not in use, the layout can be mounted on the wall just like a big picture. 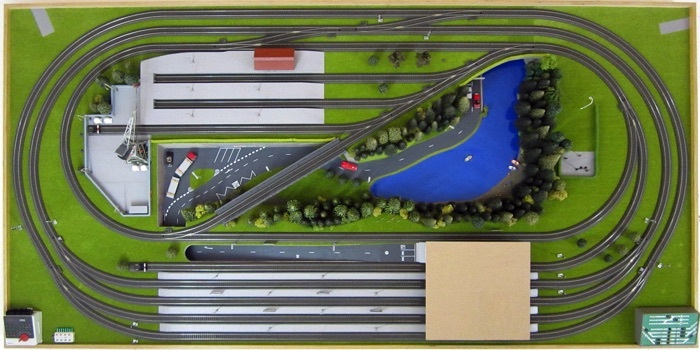 The landscape of the layout corresponds to a fictive countryside of the Swiss Middle-Land. The place Erlensee derives from the name of our home village called Erlenbach. My kids learned a lot about electricity and the way how the train system works in reality. A very nice hobby which lost a lot of enthusiasts to the world of computers during the last couple of years. 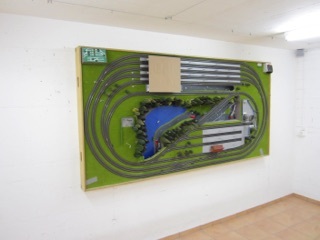 The model railroad layout has now a new owner and was sold to a happy pensioner in the sunny Ticino.